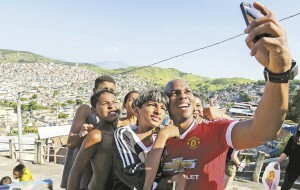 RIO DE JANEIRO, BRAZIL – Dwight Yorke and Quinton Fortune of the Manchester United football (soccer) club were in the Zona Norte (North Zone) of Rio last weekend to spend time training with youths in the favela community of Chatuba in Complexo da Penha. The event was held at the Caracol pitch in partnership between the UPP (Police Pacification Unit), the NGO Child Street United and Manchester United club. Street Child United brought some football legends from Manchester United club to Complexo da Penha favela in Rio’s Zona Norte (North Zone), photo by Gustavo Oliveira-WBRPhoto. The open training session was held for about seventy children from Chatuba community, and as hosts of the match, the former idols of the English team Yorke and Fortune played with young athletes and handed out autographs. The two professional players are in Brazil promoting the global campaign “I Love United”, which seeks closer ties between the club and fans worldwide. They acted as coach and helped the young players in the field, which was renovated and opened May 30th last year largely in part by Street Child United. The football pitch and the playground are located on the Morro do Caracol hill in the Complexo da Penha, a community close to Vila Cruzeiro and Complexo do Alemão, where violence between police and drug trafficking gangs are all too common. The pitch was built with the agreement of the local residents’ association, the UPP (Pacifying Police Unit) and even the drug trafficking gangs, who all agreed that the pitch will remain off limits, so the children can play safely. “The pitch is a safe place for the children to play. They face extreme violence with the shootings that happen every day. Here they are safe.” said Joe Hewitt, director of the Street Child United charity in Brazil at the inauguration last year.